Druids Down Under has been set up for the purpose of exploring Druidic spirituality in Australia. Through combining the inspiration of our tradition in Druidry with the spiritual essence of the land we live in, we aim to find a connection with the sacred landscape. Wow, it's been a long time since I last posted. A lot has been going on. One of the most exciting is I've been writing. I'm excited to say I have my first book coming out next year. It's being published through Moon Books, a publishing house that focuses on Pagan authors. My book is going to be part of a series of books called "Pagan Portals" that are introductions to different kinds of pagan paths. It's going to be called "Pagan Portals - Australian Druidry: Connecting with the Sacred Landscape". I'm going to have copies available next year and it will be available in stores from September 2017. What you find in my blog here are some of my earliest thoughts on similar topics that I cover in the book. The book is basically a how-to guide for adapting your practice of Druidry to an Australian landscape, but it can also be of use to anyone looking for tools and practices that will help you better understand your local area and to celebrate changes in the seasons. In the book I take you on my journey of discovering the local wheel of the year in coastal Sydney, from the very beginnings of my discomfort with popular festivals when I was a child, to my travels in the UK, and the process of putting together the wheel here in Australia and developing a depth to it that really helps me and people I practice with to find a connection with this land. I also look at animal and plant symbolism, ways we can approach the elements and the ancestors in ritual, as well as the role of our Bards in finding new stories for the land and her spirits. The book starts out with explaining my own story and then goes into depth on how you can work out the depth of meaning in the plants, animals and seasonal changes of your own area. It then helps you to put it all together with ritual practices that will make sense, no matter what the changes that are occurring in your area, or what kind of place you live, or even what kind of diverse backgrounds the people in your group have. It's a practice based on what I've learned from others, and what I've experienced first hand, what I have found useful in group rituals and what will work in many different environments, and even a changing environment. I'm going to have information available soon on where you can get copies or do a pre-order. I'm also planning on doing a tour around Australia in 2017 and 2018 to do some workshops and rituals with you and bring along the books for you too. In other news my family and I recently moved up to the Blue Mountains just outside of Sydney. So I'm rather in research mode finding out about this very different landscape and working out a whole new cycle of festivals that we might be able to celebrate here. It's been a wonderful journey so far. 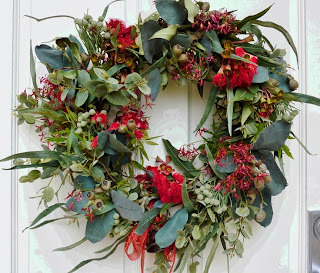 I loved the mists and frosty mornings in winter, the excitement of the local orchards bursting into flower at spring, the new red growth of the gum trees and the very different times that the native flowers bloom. There are also very different birds - yellow tailed black cockatoos, crimson rosellas, king parrots, grey strike thrushes, kingfishers, pink robins, honeyeaters and tiny wrens. We've been exploring new waterholes and creeks, looking for caves and enjoying having a property that backs onto the national park. It's a real tree change from living on the beaches. This coming weekend we have the first Druids Down Under gathering being held up here at the local community gardens. I'm really looking forward to that. It will be great to feel into a new sacred space for our group and to meet some of the other local people interested in the tradition. We're going to have a workshop on seasonal rituals, then through the workshop we will create a ritual that we will all do together to celebrate the seasonal changes and feel ourselves come into alignment with them. Then we'll finish off with some food. It's officially free of charge, but I always encourage people to energetically pay for the event with the exchange of bringing along some Bardic offerings to share, so that could be a song, a poem, a story, or a blessing. If you're in the area and would like to come along. It will be at North Katoomba Community Gardens from 3pm on Sunday 11th December 2016. I'm also going to be getting some full day workshops going up here next year too, so keep your eyes open for that coming up. I do most of my events on facebook though, so do join our facebook groups Druids Down Under, and the Sydney Druids Down Under for more local events. Another fun thing is I have been making podcasts. I haven't had chance the last couple of months, but I do plan to get back into it. But there are quite a few up already and they're a fun listen incorporating my various interests in Druidry, jewelry, ethics, pagan events, and all kinds of other things. If you have a long commute and feel like eavesdropping on my conversations, please go ahead! It's called Forest Spirituality with Julie Brett and you can find it on either the iTunes or Podbean apps or websites. Ok, that's all from me for now. I will have more info on all of that as soon as I can get it to you. There are times, particularly when we have young children, that the festivities going on around us in wider culture become an important part of life, whether it falls into our belief system or not. As we have been coming up to the holiday season and the midsummer solstice, the intensity of Christmas activity around my family has been giving me a lot to think about. My son, who is two, adores the Christmas trees that decorate the local shopping malls and my parents’ home. We have paid our respects to the fire festival in our home, however, his interest in the external goings on have also encouraged me to invite a selection of the more traditional decorations into our home too. The question I have been tumbling with is “how?”. As someone who tends to baulk at the disconnectedness of having pine trees, fake snow, holly and reindeer decorating the place in the middle of summer I have had a lot of difficulty with this. I needed to make it feel right in my head before I could meaningfully bring it into my home without feeling I had somehow been coerced into it. I have spent a fair amount of time thinking about this and have discussed the idea of combining the festivals of X-mas and Litha with many fellow pagans and Druids. It has been an eye-opening time. There are various ways that people go about doing it. It seems that those who have children do tend towards making it more of the “traditional” x-mas style event, while those who do not, might be happier to use some x-mas decorations in tandem with decorations for Litha. Personally, for the last eight years I have been happy with my red and gold decorated bare branch painted black, which for me represents the rebirthing and cleansing energy of the fire festival, but also gives us somewhere to put the presents. Probably the most important thing for me in this discussion is “to tree or not to tree?” and by tree I most certainly am referring specifically to the pine variety, whether real or fake. It is just so undeniably the most important symbol of the popular celebrations. To have one is to invite in the “spirit of Christmas”. It’s what Santa is looking for when he turns up, right? It’s the same thing that every other family in our culture around the planet wants to have in their living room. Somehow I feel like my blackened stick, though beautiful and meaningful, is missing something, particularly when it comes to the Santa myth. So. Alternatives? Where to now? I had a small revelation the other evening. I had just purchased a beautiful statue of Cernnunos and was thinking that its colour – a green with a gold sheen to it – was rather Christmassy. I then thought about the connection with the celebrations of other pagans around the world at this time of year: as many of us bring into our homes the traditional decorations of Yule, despite the seasonal incongruities, we are connecting all at the same time with the heritage of our ancestors. I realised that to make the festival have real meaning, while bringing into my home the out-of-season and non-native pine tree, all I needed to do was imagine it as a process of inviting in a tradition that is globally shared and connecting with the pagan ancestors of the past. The idea of “the three ancestors” is something dear to my heart. They are the ancestors of “blood, mud and wisdom” as Emma Restall-Orr has called them. They are the ancestors of our bloodlines who have given us our physicality, the ancestors of the land that we live in who provide us with a sense of place and being, and the ancestors of our inspiration and learning who have made us who we are in personality and mind, and create our culture too. The incorporation of this idea as important to the x-mas celebrations seemed to fit very well: my dilemma could be described as a three way tension between a) the bloodline ancestors as represented by the traditional yule and Christmas decorations, b) the inspirations of both the culture around me in x-mas and my own pagan culture’s celebrations of Litha, and c) my connection with the ancestors of the land as the fire season, summer, the beach etc. In acknowledging this as a time where all three ancestors should be honoured allows an amazing balance to the way I see things that is helping me to reimagine what I feel about this time of year. Our tree will be a pine. There are two reasons for this. One is that it connects with the traditions of yule and the yule log, also that it is a tree of the northern hemisphere where my ancestors came from. The other is that it is representing the global tradition and a symbol of the myth of Santa. I think the idea of Santa is a very important moral myth in popular culture, particularly for teaching children about the dynamics of giving and receiving from others, and the difference between being “naughty” and “nice”. There are certain capitalist values woven in there too, for example, the focus on materialism and that we reward good behaviour with monetary value. These are a reality of the world we live in, but they do tend to grate on me and if we look at many of the Christmas movies out there, you can see I’m not alone. There is also a counter-mythos in much of our understanding of Christmas, that the material focus of receiving gifts is not the real spirit of the season, but rather the self-less giving of gifts and a sense of family, charity and caring is more important. Santa has his associated rituals: writing the letter, getting the photo, leaving out the cookies, milk and carrots, singing carols, but most important of all is having a tree and giving gifts. It is amazing what a difference having a child will do for the way we choose to look at festivals that have a place in popular culture. They want to be involved in everything, and there is no way we can stop them, nor should we. This is the reality of the world they live in and to be fully functioning little humans, they need to understand as much as they can. The least we can do is bring meaning to the process so that they can have an even deeper experience with it, helping them, and us too, to understand all that we have been given and all that can be taken away, and feeling a deep gratitude for all that is. 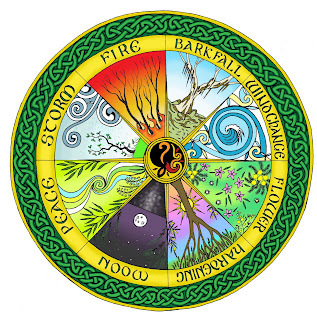 I often wondered about the traditional Pagan story of the wheel of the year, where the God dies and is reborn in the winter, grows in the spring, matures in summer and becomes and elder in the autumn, to die and be reborn again in winter. I wondered whether it could fit into the wheel of the year I have created for my own area in Sydney, but have generally fallen short as to whether the death and rebirth time would happen in the winter or the summer. Should it come with the death of the darkness and the rebirth of the sun as it begins to wax through the spring as in the traditional story? Or should it sit in the fire season, a time of so much death, rebirth, cleansing and renewal, making way for a new kind of life cycle story? How could it work? I thought about it many times and no matter which one I decided on, I always felt that the other was somehow being neglected. There are quite clearly two times of death and rebirth in our wheel, so how could it work as a story? I wondered whether there could be an intertwining of stories somehow – two deaths; two life cycles in the year. Would they both last a full year, with overlapping stories to tell, or might there be another way? This is the conclusion that my fellow druids and I, at one of our ritual workshops once discovered. It was Peace festival and the autumn equinox and we were thinking about the meaning of the changeover from the light, active, external half of the year to the dark, passive, internal half. We felt a shift in moving from one to the other, but, thankfully, not like another death to make things even more difficult: it was more of an initiation and maturing; a coming into an emotional adulthood, where now, in the dark time, we would begin to work on our internal lives. Noticing this time as a kind of adulthood, conveniently halfway between our two rebirth points on the wheel, we realised that the year could indeed be split into two lifecycles, though each would only last six months, with an active summer child, born in the fire season and an introspective dark child, born at midwinter. The light child would come into adulthood by realising their dark self at the autumn equinox, while the dark child would realise adulthood in coming to light and action at the spring equinox. The idea of the two lifecycles made us more aware of the split of the year into a light/active half, and a dark/introspective half with counterpoints at the equinoxes and the different energies of these times. The light/active part, from spring equinox to autumn equinox, is where the focus is on taking action and dealing with the external world. Through this period what we have learned in the introspective, dark part of the year comes to take form in the physical and we are called on to put our ideals and values into practice. It is a time to walk your talk and explore physical connections with the Earth, the trees, and other beings. The dark/introspective part of the year, from autumn equinox to spring equinox, is a time when we look into the self and to the spirit realms for guidance and reflection. We work on our internal selves, with our own emotional and spiritual development being at the focus of our activity. We work on improving ourselves, planning and studying in preparation for the more active time. Of course this is only a focus of our spiritual activity, and not a suggestion that they be exclusive to one another. It would of course be impractical and boring to limit ourselves to one or the other. It’s not a limitation, just a guide for what the energies of the time are guiding us towards, particularly in ritual and group work. Since that Peace festival gathering, we have seen that this idea falls quite naturally into the Sydney Wheel of the Year we have been using, and also enriched it, particularly as it brought greater meaning to the Peace and Wind Change Festivals at the equinoxes, where the initiation into the light and dark mysteries occurs. There is a great deal of potential for further development in the idea too I believe. I feels really right and we will be exploring it more in coming years. Feel free to explore the idea for yourself. Here is a summary of the way that the lifecycles develop through our Sydney Wheel festivals through the year. I will give a brief description of the festival’s ideas so that you can feel what is going on at that time and see how it works with the life cycle stages. It will also be useful, I hope if you’re not familiar with the Sydney Wheel of the year. I hope this helps you to get a better picture of how it all works. FIRE – The height of summer’s heat, the dry fire time. Often overlaps significantly with Storm festival. Celebrate rebirth and renewal, cleansing and waymaking. The active elder dies and the active child is born. STORM – The active child has a frenetic energy of fertility and life, though often also flood. At this time we can often refer to it as the Tempest Child of flying emotions that need to be set free and released. Celebrate coming to life, growth, fertility and creativity. Set the tempest child free through dance, song and movement. PEACE – The intensity of summer passes. The active child initiates into the dark, introspective adult of inner wisdom. Celebrate peace, comfort, meditation, reflection, the inner worlds and the inner self. MOON – The skies clear of humidity and the moon shines brightly in the crisp, fresh air. You can see for long distances and the stars are bright. The dark adult matures into the dark elder, keeper of the dark mysteries. Celebrate divination, the otherworlds, ancestors, psychic abilities, healing and magic. HARDENING – The bark on the trees shelters them from the winter cold. The sun is reborn, and so, the dark elder is reborn as the dark child. A time for indoor activities and the celebration of home and hearth, study, feasting, friendship and storytelling. FLOWER – Flowers in the bush bloom like words on the poet’s lips. The dark child is intuitive and wise, and represents a connection to our own inner child who is full of inspiration and innate wisdom. They are the Flower Child of freedom. Celebrate inspiration, youth, beauty, art, poetry and love. WINDCHANGE – A time of warm weather before the rains come. Sunny days, cool waters and blustery winds – the winds of change. The dark child initiates at this time into the active adult. It is a time to put what we have learned in the dark time into action to make a difference in the world. 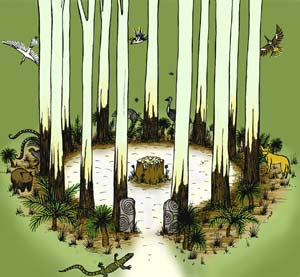 BARKFALL – The bark breaks and begins to fall away in preparation for the times of fire and burning. A time to release and let go of what is no longer needed. The active adult becomes the active elder, keeper of the light mysteries – practical knowledge, skill, craft and action. This is a time of much movement, purpose and activity. The wheel of the year may work for your area even if you’re not in Sydney. Many people over the country have told me it works in their areas, whether they are from Queensland or Victoria, there seem to be at least a few overlaps and maybe just a slight adjustment on timing. By exploring your own area you are sure to work out a unique wheel of the year and then the life cycle stories will have something special to add to it, no matter where you are. For our group, bringing this idea of two life cycles into our wheel of the year has helped us to reconcile the traditional story of the lifecycle and has made it easier for us to understand our own personal progress through the year. The energies of the seasons reflect the life stages of the two stories and it brings greater meaning to each one of the festivals as it is a deeper layer onto the way we understand them: the storm season for example not just being a time of fertility, growth and emotions, but of the tantrum-like emotions and flowing hormonal floods of a growing youth blooming into their true self. It has helped us to add extra nuance to each season in this way, and to see how we can relate to it in richer, more meaningful ways bringing balance to our psyches as we explore the different parts of ourselves as child, youth, adult and elder. Last year Druids Down Under in Sydney met regularly to do workshops on ritual for the Sydney wheel of the year. We met at approximately monthly intervals on weekends with the purpose of observing the changes in the land around us and bringing the ideas which formed from that together as a group to discus their significance as symbols for ritual. We used the wheel of the year which I had created for Coastal Sydney, and even though we were holding our workshops in South Western Sydney, we felt that much of the symbolism was the same, save for a few flowers which did not bloom there, or the coming of frost which isn't felt nearer to the beach. Each workshop was divided into three sections: 1) a discussion of the natural changes which had occured and the most significant natural phenomena of that particular time, eg. storms, insects, cold wind, wattle blooms etc. 2) We discussed the meaning of these as symbols and how to interpret them for spiritual understanding. We also worked out ways that this knowledge could be brought together to create a ritual. 3) Using a basic ritual format I had adapted from circles in the British Druid Order I had attended, we created and held new rituals which incorporated these ideas. It was a great success and the group which formed out of it now work well together in ritual, as well as sharing a common bond in following this cycle together through the year. As we enter 2013 we will be starting to hold a new series of workshops to deepen this knowledge and open it up to new members. It has been a wonderful journey so far with the main basis for practice having been a focus on the seasonal changes. This year our focus is to be on expanding upon that, but also on bringing in a closer melding of the traditional Celtic mythologies to different festivals. Some examples are the story of Brigit for our Flower Festival in August which is similar to Imbolc, or the story of the Mabon and how it can relate to the Peace Festival around the autumnal equinox. It is going to be an interesting year of exploration. These workshops are public and further information about them can be found via our facebook page. Just search for "Druids Down Under". Alternatively you can email me, Julie, at julie.d.brett@hotmail.com, though facebook is our preferred method for networking and posting events. Making it Personal – the triad of ancestors. I have found this triad of ancestors to be incredibly inspirational in finding balance in my own practice of Druidry, and I hope that by sharing my understanding of it, you might be able to do the same. Wherever you are in the world, this way of thinking about the ancestors can help you to understand more fully the unique nature of your own experience of the world as a Druid. The Celts revered their ancestors a great deal, remembering their feats and adventures in the tales and mythology, some of which survives today. People were deified and turned into gods and goddesses, their actions exaggerated and used to find deeper understandings of the world through mythological symbolism. Their adventures turned into moral tales giving us guidance in our lives. These ancestral figures can be important to us as inspirations of how to live, but there are also our closer personal histories. Many people, Druid or otherwise, find that exploring their family tree gives them a great sense of their own personal identity. To understand where your family members have come from, their lands and the stories of their lives you might like to do this yourself. Think about how where your ancestors have come from might influence who you are today? You might like to find out more by looking up the meanings and histories of your family name. Where were the people from? What is the language background? What occupations did they have? What are the traditions of the lands they come from? You might find things out that you couldn’t have imagined. The importance of the ancestors of our bloodline can be particularly important for Druids if you are not of Celtic heritage. You may feel that you want to incorporate gods and goddesses or stories and beliefs from another religious or cultural path into your Druidic studies and practices. This is of course perfectly acceptable as there are many paths to the source, and a varied cultural approach can make for an incredibly interesting and inspiring ritual life! It can be a fantastic thing to have a Druid based ritual honouring a Goddess of Greece, or India, or that uses ideas from a Buddhist practice. The options are endless. This brings me to the ancestors of tradition (which I also understand as ‘inspiration’). We do not have to be of the bloodline of a particular culture to be inspired by it and to be able to use it in our practices. I myself have used a wonderful Shinto waterfall purification ritual as an inspiration, changing it to suit my own beliefs and names for the processes and energies. Druids are inquiring people and many have varying interests in many of the world’s spiritualities. To include these ideas in our rituals can help us to expand our understanding and express who we are and what we are inspired by. Many Druids are inspired by traditions such as those of the American Indians, Hinduism, Buddhism, Shamanism, and so many others. The third kind of ancestor is those of the land. I think this is the most important of the three, as it makes us acknowledge that our tradition is one of connection with nature. Acknowledging the ancestors of the land means that no matter where we are, we should honour that place, it’s history; it’s spirits. For those of us ‘down under’ I think this is really important as it makes us aware that we can’t just transplant a northern hemisphere tradition into the southern hemisphere and expect it to feel right. There has to be a connection with the local ancestors of the land too. Learning more about the spirit of your local area can be a fascinating process and deeply enriching to your practice. In the last two issues of Serpentstar we have explored native animals and plants, their energies and divinatory symbolism. Learning more about native plants and animals and the seasonal cycles of the native forest is a fantastic way to attune with the ancestors of the land and honour them in our practice. Another way is to learn more about Indigenous culture: learning to respect and acknowledge the wisdom of the people of your own area. Even simple gestures like acknowledging country at the beginning of your rituals can be a great place to start. And incorporating Indigenous myths can be especially enriching to ritual, especially outdoor ritual as so many of the stories are related to specific landforms. I hope that you find inspiration and balance in working with the ancestors in this way. Different people will have very different paths following this guide, but it can help us all to recognise our individualities in following a unified principle. Where one person might find that all three ancestors lead them to Celtic inspirations, another may find that the only place Druidry is relevant to them is as a tradition – but it’s all Druidry! It’s all about making it personal and expressing your own unique place in the world through your spiritual practice. - As published in the Imbolc 2009 edition of Serpentstar, the OBOD Southern Hemisphere newsletter. When it comes to learning more about the magickal properties Australian plants and trees there are many good resources available that we can learn from. Resources like the work of Ian White with Bush Flower Essences can tell us much about the magickal uses of Australian flowers. There is also a wealth of information about bush tucker and native foods and medicines from both Indigenous and non-Indigenous writers. It is wonderful to learn about how we can find food and medicines in the bush which can enrich our ritual pracitice as learning more about the natural environment helps us to become more connected to the cycles of nature around us. As with animals, as I discussed in the last issue, a good way to learn more about the magickal meanings of plants is to see them in nature and spend time with them ourselves, meditating on their specific energies. We can learn much by working intuitively, learning how to interpret their symbols for ourselves. For centuries the medicinal properties of plants were thought to be encoded in the way that they looked by what was called the ‘doctrine of signatures’. The plant might look like a certain body part or a symptom of a disease. For example, if a plant had red spots it might have been used for skin rashes. It was by this process that many of the herbal remedies we know today were discovered. However, as there are many poisonous plants in Australia and those which are edible often need a lot of processing before they can be ingested, so don’t try this at home. These days, when it comes to medicine, we are lucky enough to have the hard work done for us, and needn’t work with trial and error. Always act with caution with wild plants and use a reliable fieldbook reference to identify them before harvesting them. Bearing this in mind, there is much we can learn by taking field trips into the bush to learn about the magickal energies of plants, and can then use them in meditation, ritual, altar decoration and divination, without too much need for understanding their uses as food or medicine. As with animals, there is a great diversity of plants and trees throughout Australia, and creating a definitive guide to the country as a whole would be an arduous task, as each place will have its own species, symbols, cycles and therefore meanings to be found. There is certainly not enough scope for a difinitive guide in this article, however, I have put together a set of Australian plant oracle meanings for you to begin your journey into understanding more about the magick of nature all around you. And hopefully you will be able to use this as a guide to finding out more about your own unique local plants. Tree divination is connected with the Celtic ogham script, which is the oldest script ever used in Britain. Each of the letters represented a tree and a corresponding divinatory meaning. The letters were used for inscriptions on grave markers, memorials, tombs and also for sacred charms and spells. Many Druids today use this alphabet for divination and other magickal work, as well as using it as a guide to understanding the energies of the forest. Many people seek out the different trees and create a set of ogham sticks for use in divination. However, as many of the trees in this alphabet, including species such as oak, ash, rowan, and birch, are hard to find in Australia, I have found that working with the more familiar native trees much more useful, and the process of creating a native ogham set is a wonderfully fulfilling activity in itself. Some people may prefer to work with the non-native trees and some may live in an area with many european trees, they may even plant them in their gardens, so that they can access them more easily, but as native trees provide food and habitat for native species, choosing to plant them instead we not only gain access to the wonderful native energies, we also attract more wildlife into our backyards. Using native trees, I have found it quite interesting to create my own alphabet of symbols to represent each tree that I have found, although some people like to study both the traditional ogham and their native findings to get equivalents of meaning, and then use a matching ogham. What is important is that it feels right to you. By using a uniquely Australian ogham and becoming more in tune with the plants and trees of the bush we can also make bushwalking much more interesting as we will come to learn a whole new language of the places we walk through. We will feel their magickal essence, and not just appreciate their aesthetic beauty. You might find that in doing so you will discover not only a set of ogham sticks to make for yourself, but a set of sacred locations relating to the energies of each of these plants and trees that you can then use for divination, meditation or ritual. 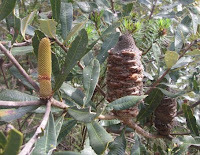 BANKSIA Banksia trees have gnarled bark and branches that look like the skin of the old and wise, the floral columns have a masculine energy, and as they turn to seed pods and open, they look like laughing mouths. They symbolise communication with spirit guides, fertility, life giving, masculine energy, longevity, wisdom of age, joy and energy. Bright red floral brushes, the colour of our life-blood, the colour of passion and love, blooming after rain they represent fertility and love. Their bottlebrush name invokes banishing, cleansing and renewing energies. Red, the colour of fire, they represent death and rebirth, doorways and entrance to the underworld. Eucalypts represent the king of the forest, leadership, clarity, goals, focus and healing. There are litterally hundreds of species, each with their own energies. Generally they increase energy and boost the immune system, healing and cleansing the body and providing rejuvenation and connection. A particularly interesting eucalypt for the scribbly patterns found on the white trunks. Best seen before barkfall, they represent communication, divination, mediumship and channeling. Look at the bark to find symbols and messages, paying attention to the direction they face and the elemental correspondences this represents. A eucalypt with thick strong fiberous bark. They represent strength, determination, protection, and prosperity. With their long leaves and curling flowers, they represent beauty, femininity, love, peace, elegance, and grace. They can be found in many colours with white for the moon, yellow for the sun and red for fire, love and passion.They may be trees of small shurbs, and may have large or small flowers. Infuse their essence by soaking their flowers in water in the sun. Paperbark bark is waterproof and was used by the Aboriginal people to make shelters, bowls and other items. The leaves were used to make tea by the early settlers, and the essential oil is used today for many medicinal purposes. The magickal representations are protection, healing, safety and security. It is also important for children, art, and learning as the papery bark represents books, study and creativity. These beautiful trees are always found by the water. They are sacred to mermaids, oceanic wisdom, rivers, lakes, tides, fishing, sea creatures, femininity, and therefore also the moon and the mother as the waters. Aboriginal people say that the whistling of the wind in their fronds are the voices of the ancestors and spirits around us. Flowering from the winter solstice to the spring equinox the many varieties of wattle are sacred to the sun and the solar festivals. The golden orbs represent not only the return of the sun but also wealth, success, good fortune, masculine energy, and abundance. These huge majestic trees have a dark, powerful and mysterious energy, but at the same time they provide fruit and nuturance, their wide trunks creating cosy sitting spots where one can feel enveloped in their energy. A wonderful tree for meditation, for magick and mystery, protection and nurturance, their towering nature invoking leadership, safety, strength, and a love akin to that of parents for their children. Standing on the shore between the worlds of land and sea, mangroves represent doorways, and entrances to the otherworld, as well as duality, balance, change, adaptability. Being aware of two ways of being they give us the power to embrace spiritual sight and intuition. One of the few native deciduous trees, with beautiful pink blossoms flowering after storm festival, they represent beauty, love, fertility, passion, regeneration, rebirth. They stand as a communicator between the nothern and southern cycles, a translator of traditions and a symbol of adaptation, and understanding. With motled bluish and bright orange bark and blood-red sap these enchanting trees are at their most vibrant just after barkfall near the summer solstice. Their bark becomes a brighter orange representing the fire season and the shedding of unwanted energies. They represent fire, release, change and transformation, purification and cleansing. You might like to make a set of ogham sticks which you can use for meditation and divination. The best thing to do is to find a tree which you would like to understand better. It may be one from the list I have provided, or it may be one local to your area. Spend some time looking at it, feeling its energy, letting it know who you are and what you would like to know. Then spend some time meditating near the tree. You might like to imagine yourself as the tree, learning to feel and be as it does. Once you have come to understand something about the tree and its energy its time to ask for a stick to make your ogham with. To do this, first find a suitable branch with a twig about 1cm in diameter and about 10cm long. Hold it and ask the tree (either in your mind, or out loud if you feel comfortable) for its permission to take the twig for your magickal purposes. You should get either a good feeling or a feeling that the tree needs the branch and that you should find another one. Take heed of your intuition here as the tree may be putting energy into new growth and taking a part of its branch may threaten its life. You will usually find that if the tree wants you to have the twig it will break surprisingly easily, but if it needs it you will have a lot of difficulty removing it. Remember that a branch given freely will give you much more of its essence and power freely in the future. Once you have your twig, cut it to the appropriate size and carve off a part at one end to draw on the symbol of the tree (make one up if you like), and on the other side carve it again to write the name of the tree so you don’t forget where it came from. Remember to record what you learned about the nature of the tree and its meanings so that later, when you have a few sticks you can use them for divination. Keep them in a special bag or box together, and when you need to ask a question, shake the bag or box, concentrating on the question, then take a stick and read the divinatory meaning for your answer. Learning about Druidry is about learning how we, as humans can more intimately relate to the world around us. Through ritual, meditation and our philosophies we find ourselves evermore in tune with the earth’s cycles and energies. Our ancestors worked with the changing seasons, and saw that these could be recognised in the changes of the trees, the animals and the stars. Many people studying Druidry today, however, are located in many varied corners of the world where the signs we can see in the trees, animals and even the stars are not the same as those in the land of our ancestors. Yet there is much to be learned about our unique places by learning to understand the messages and signs that nature can give us, wherever we are in the world. Learning about native animals is one way that we can learn to understand more intimately our own place in the world. By understanding the cycles of the animals of the land, sea and sky we can learn more about the seasons, ways to celebrate change in our world, and essentially learn about ourselves. There are some resources already available for you to find a guide to the symbolic meanings of Australian native animals, such as the Animal Dreaming oracle deck and book of the same name by Scott Alexander King, however it can be very helpful and informative for us to spend time with native mammals, reptiles, birds and fish to see what symbolism we can find in their nature. By noting their colours, their habbits and habbitat, their mating season or rituals or other features about them we can learn what they represent on a spiritual level. You might also come across tarot decks or books on Aboriginal myths which can give you more insight into the nature of native animals. Aboriginal myths can be used to gain further insight into the nature of the land also, and can be a wonderful resource for guided meditation. It is important to note, however, that Aboriginal mythology is often secret and very sacred. Stories hold power and are owned by people and places. However, there are myths which we can find in published books and these are available to everyone and as long as we treat them with respect, by acknowledging the author and their country if we use them in ritual. If you are lucky enough to be told a told that a story personally, be sure to find out if there are laws concerning its retelling (for example, only for women), as you may not be able to pass it on to others. Here are some Australian animals and their magickal meanings which I have discovered myself, but they may also have similarities with other systems as of course, these are the symbolic nature of the animals themselves. The name ‘koala’ means ‘no water’ as koalas do not need to drink and get all the moisture they need from eucalyptus leaves. As a result they represent resourcefulness, adaptability and survival. They spend much of their time drowsy or asleep, so they represent inner journeys, dreaming and meditation. They are also quite noisy at mating time making them a symbol of passion, but also of anger and jealousy. The image of the big red kangaroos with their muscled chests, fighting for their rank and right to mate represents the kangaroo’s magickal symbolism in strength, power, protection and masculine energy. The pouch of the mothers represents the closeness of mothers to their children and the process of motherhood generally. They also represent travel, endurance and attentiveness. Living in underground burrows and coming out in the night, wombats are a symbol of homely comforts, homesickness, and stability. With their thick, stout bodies they represent standing your ground, self confidence and security. The energy of the wombat is of reliability, responsibility, study and family life. The cackling call of the kookaburra is a familiar sound over much of Australia, sounding much like a hearty laugh they represent humour and looking on the bright side of life. As they are often heard laughing before storms they represent weather knowledge, storm energies, insight, divination and prophecy. Women's mysteries, duality, sanding on the thresh hold of worlds, mysteries of childbirth, mysteries of evolution and progression, adapting to new situations, changing to suit our environment. Dingoes often hunt in packs so they emulate teamwork, leadership, hunting, cunning, and wit, working smart not hard. The dingo cannot bark but only howl. They are generally silent showing us the virtue of holding our tongues when we may want to comment too quickly. Leading by example not by explanation. "Do as I do, not as I say". Emus have a striking glare and a controlled and threatening step. They are curiosity, by not timid. They represent confidence, persuasion, study, focus, discernment, judgement and will power. The nomad, travelling their hourney with confidence and focus on their goals. A nocturnal animal they carefully move through the trees. They are a symbol of caution and the mysteries of the night. Carrying their young clinging tightly to their backs they symbolise nurturance, agility, holding on, safety and parenting. White and yellow: Their flashing white and yellow feathers symbolise the rays of the sun, beams of inspiration and life. But their harsh calls remind us that the sun and its strength also bring fire and destruction. Black and red: They also remind us of the fires symbolising the red flames and the charred remains. Cleansing and renewing. Both birds are a symbol of the fire season and the power of the sun. The lyre bird is a perfect symbol of the Bard. With a long repetoire for different songs the lyre bird symbolises memory, poetry and song. Their silvery voices lighten the sound of the bush and their beautiful feathers and dances are a fabulous display. A performer, a dancer, singer and poet. They represent the poetic inspiration within us all. Certainly, there are many more native animals with many more symbolic meanings, and there are even regional and other variations which will give the animals different meanings in different contexts. What is important, however is that we are making a connection with the world around us, learning more about the natural world and about ourselves. Each one of us has a responsibilitiy to learn about and connect with the sacred landscape around us. To live in harmony with the land and all its creatures and to be aware of its cycles, signs and symbolism. From the mountains to the sea, from the tropics to the deserts, from the forests to the cities, we all have to find our place and learn about our land in our own way. Possibly the best way that we can learn more about the native animals of our area is to buy some field guides of birds, mammals, reptiles and fish, and find out about the charateristics of the local fauna. Another way of finding out information is to visit your local council, who often supply leaflets about conservation or the habitats of local species. You may even find that they conduct nature walks where you can be shown some of the local animals. Then a wonderful exercise for meditation is to think about the spiritual meanings and symbolisms of the animals of your area. This process can be done anywhere in the world and there are many beautiful species which we can learn so much about. Indigenous knowledge is a wonderful resource and a point from which we can learn much about the spirit of our area, however there is also a wealth of knowledge to be found in the symbolic natures of the animals themselves - all we have to do is look. I have followed a pagan path for the last fourteen years, but have always had an affinity for the spiritual and for nature. After learning about green witchcraft and following this path for many years, I found Druidry in 2007 while living in Glastonbury in England. I studied with a mentor from the British Druid Order and was initiated at both Avebury and Stonehenge in the Bardic grade in the same year. After returning to Australia in early 2008 I began the group Druids Down Under and have been working on researching the unique aspects of being a Druid or a Pagan in the Australian environment. During the formation of Druids Down Under I was also studying comparative religion and anthropology at Sydney University. Druids Down Under is now growing steadily with a strong facebook discussion and networking group and a small group in Sydney which holds social gatherings and workshops.